Food art means the arts of preparation, cooking and presentation of food, usually in the form of meals. Food brings out so many different reactions in people. Some people are drawn by taste, however some others might be tempted by its smells and visual appearance. For thousands of years, people have sought not only to make food taste better, but great progresses also have been made in making food smell and look better. After all, no one wants to eat something that doesn't look appetizing ! Art has featured food for thousands of years. It is basically the one thing to make a platter visually appealing. Although, there are specific peoples often known as food artists who dedicate their time to turning edibles into visuals, but anyone can try their hands. Art can be experienced through many ways, but all most everyone can experience the art through food because of the daily impact and history that food has on every living being. So if anyone stops to think about the role that food plays in our lives is notably significant. What we eat fully reflects our lifestyle, culture, preferences and beliefs. It is difficult to argue the importance of food, however it is possible to argue its importance in the world of art. 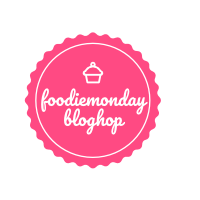 Monday is here again and the theme for 132nd Foodie Monday Blog Hop is decided as 'Edible Food Art'. So I have prepared one baked dish, Hedgehog Cookie as contribution of mine. Well, these hedgehog cookies are completely eggless and I have flavored them with oranges since oranges are in season. The cookies are first shaped as body of a hedgehog and after baking they are finally decorated as a complete hedgehog using some melted chocolate, roughly chopped tiny cashew pieces and chocolate sprinkles. Here I have used roughly chopped tiny cashew pieces and chocolate sprinkles for reflecting those spines of a hedgehog. You may use any other things to become more creative. Kids'll definitely enjoy this if involved in preparing the whole process. Without taking time anymore, lets go in details. Take butter (at room temperature) and powdered sugar in a mixing bowl. Using a whisk, mix well until a creamy texture comes out. Then add orange essence, orange zest and whisk again to mix everything well. Next add all purpose flour, salt and fold gently to form a soft dough. If the dough becomes crumbly, then add 1-2 tbsp milk. If the dough becomes sticky, then add 1-2 tbsp flour more. Take 1 tbsp of dough, shape into a ball, pinch any one side of the ball to make the face of hedgehog and finally place over a baking tray lined with baking paper. Repeat for rest of the dough and arrange all the hedgehog shaped cookies over the baking tray having 2 inches space in between. Once done, take out the cookies from the oven. Allow to cool on the baking tray for 3-5 minutes, then transfer to cooling rack to cool completely. Meanwhile melt dark chocolate chunks by using double boiler or just microwave for 1 - 1.5 minutes. Stir in between until smooth. Pick one cooled cookie by holding the pinched area (face of the hedgehog) of the cookie, dip into the melted chocolate leaving the face area uncovered so that 2/3 rd top-area of the cookie will be covered by chocolate. Allow excess chocolate to drip off the cookie and immediately sprinkle some roughly chopped tiny cashew pieces or chocolate sprinkles over the chocolate covered area. Place on a plate lined with baking paper. Take a toothpick, dip in melted chocolate and then make eyes and nose in the chocolate uncovered face area of the hedgehog cookie. 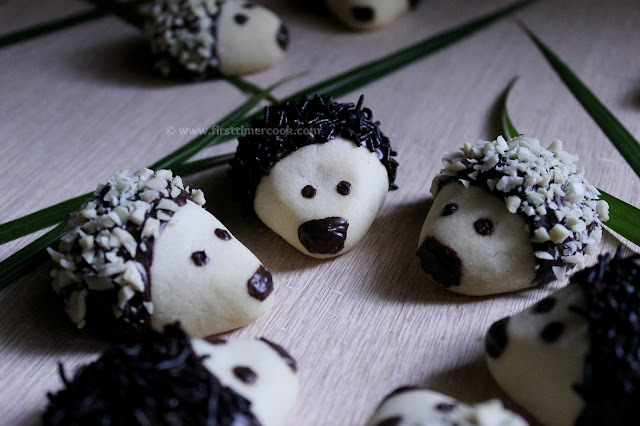 Repeat for rest hedgehog cookies and allow to harden the chocolate completely. 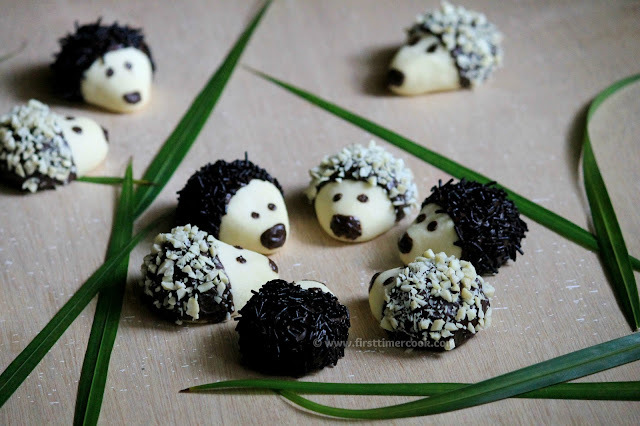 Refrigerate all the hedgehog cookies in an airtight container and while serving, take out from refrigerator and serve ! The dough has to be a smooth and soft texture. If the dough becomes crumbly, then add 1-2 tbsp milk. If the dough becomes sticky, then add 1-2 tbsp flour. 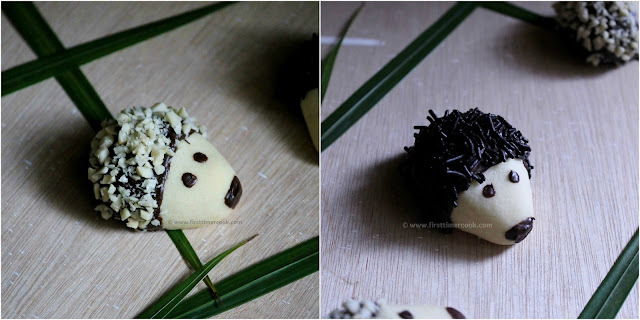 Don't worry if any cracks appear while baking the cookies, because those cracks will be covered by melted chocolate at last to give the final look of a hedgehog. Any other coating can be opted instead of roughly chopped tiny cashew pieces and chocolate sprinkles. If butter is salted one, then skip using salt along with flour. 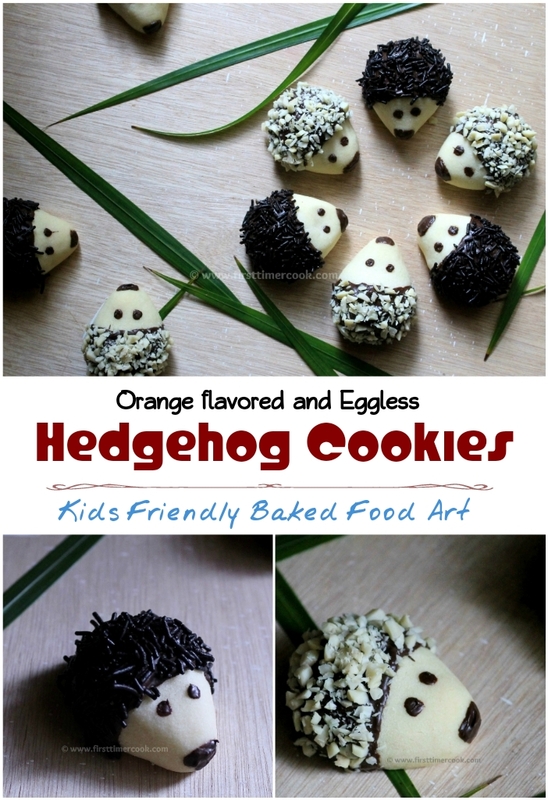 Eggless Hedgehog Cookies with Orange flavor recipe is linked to this week Fiesta Friday co hosted by Abbey and Antonia. The cookies look so adorable Sasmita.. beautifully done ! Wow Sasmita cookies are looking super cute. Awesome idea. shooooo shweeeet these are! I love them!!!!!! Very cute cookies.. bookmarking them. I can't stop staring at the cute hedgehogs. When I first saw the post on FB, I was thinking how did she do it, how did she do it? Couldn't wait to get to the computer to read the steps. Beautiful share Sasmita. I fell in love with these Sasmita!Bookmarking them! Wow...look at those cute little cookies...Thanks for sharing the recipe..
Oooooh these are soooo cute just adorable, lovely bake dear Sasmita and loved the way you have presented them. Awesome.. How cute they look.. You are so creative :) Wish you could pass me some.. Very innovative! They are so cute...I can't eat them :)) Thanks for sharing! Such cute cookies! To tell you the truth if I made them, I would be sad to eat them. They look too cute. 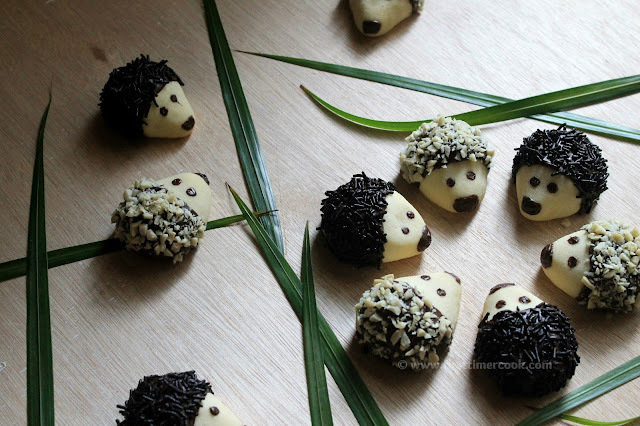 Those hedgehog cookies look sooo adorable. Awesome bake and love the way you presented the cookies. Oooooo! So cute will bake them for my little nephews when they come down. They will be thrilled. Super cute cookies, you nailed them with your culinary art.. Perfectly baked goodies..
How cute do these cookies look!!! Loved the presentation and of course the recipe is awesome! I am trying this for my 4 year old. Looks cute and this will be fun for kids. My daughter will be trilled to do this. Thanks for the recipe. Can't take my eyes off from those beauties... looks so cute :) Bookmarking this.. Will try this soon ! Thanks for sharing.. They look so adorable, I don't think I will be able to eat them. Creativity getting yummy.. I will try this for sure. Omg, how cute and adorable those cookies looks, if i bake these cookies i wont let anyone to enjoy;;lol.. Seriously too good they are. These are so cute! My kids would love them so much they would probably want a hedgehog after this. These hedgehogs are super cute, I would just keep them. These are so cute! Thank you for sharing at Fiesta Friday! 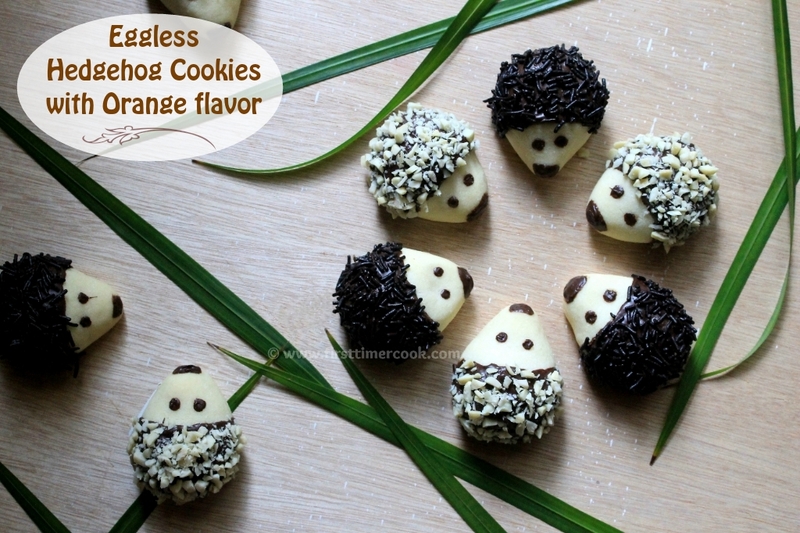 Very cute little hedgehog cookies with so simple ingredients. Main trick is to shape them. Awwww these cookies are so cute and adorable, I wouldn't eat them :) really a creative piece! These cookies look way to cute to be eaten!! Definitely a hit with the kids! Superb share! I agree about the fact that people eat with their eyes. Presentation is the key and making the food look so good and appealing for kids can only be done by you so nicely. Loved the recipe and the use of seasonal produce - oranges. Beautifully done Sasmita. Hedgehog cookies look so cute. Such a neat art work. Awesome!!! How many cookies are you baking from this portion of dough?